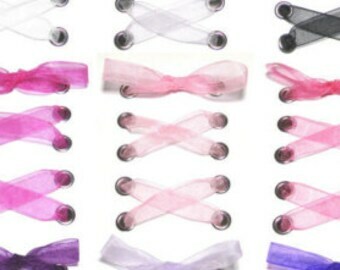 THE SHOELACES SHOP-Pink, Purple, Iridscent Shoe Laces, Ribbon Shoelaces, Cute Shoelaces, Custom Shoelaces, Shoe Laces, "You Glow Girl"
LOOKING FOR QUALITY RIBBON SHOELACES? Hurray! - You've found the right shop! I use only professional tools and techniques and have over 10 years of experience in making custom shoelaces, so you won't find better handmade quality anywhere else. These iridescent shoelaces look like different shades of pink and purple as their angle changes in the light. These colors look really vibrant on brown shoes and even blue shoes. 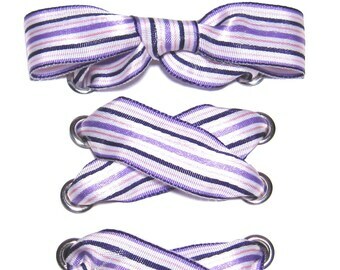 These woven shoelaces are narrower at 1/4" wide. 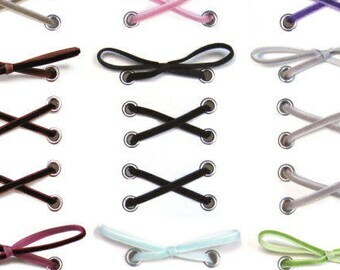 Shoelaces are sold as pairs, not individually. Choose the length you need and the tip finish you want (please take a look at the information below about tip options and lengths). The following information can help you select the most appropriate tip option(s) as shown in the last picture of this listing (on the mobile app just scroll right to see more photos). ╘►PLASTIC◄╛ -(Small [Clear only*], Medium and Large Eyelets)- Plastic tips are available in Black, White, Purple, Clear, Light Red, Blue, Yellow, Orange, Green, Pale Gray and Light Brown. Plastic Tips are form-fitting, so they adhere to the natural shape of the lacing fabric. 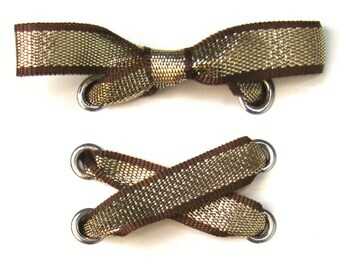 *Clear tips are narrower than the colored tips, and only the Clear tips will fit Small Eyelets. 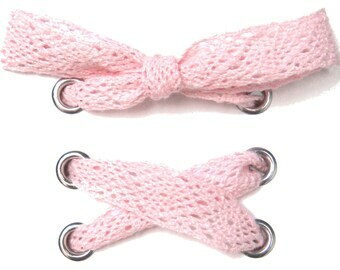 ╘►WIDE CRIMPS◄╛ -(Large Eyelets)- These are a lovely touch for any lacing fabric. At 3.5mm in diameter, they are meant for Large eyelets (like Converse sneakers have), so you will want to take the "Tip Test" if you aren't sure whether you have large eyelets. ╘►LONG DANGLES◄╛ -(Medium and Large Eyelets)- Long Dangle tips use a narrow metal crimp with a free-hanging paddle charm that is approximately 1" long. Long Dangles are not recommended for small children for whom they may pose a choking hazard. ╘►SHORT DANGLES◄╛ -(Medium and Large Eyelets)- If the Long Dangles are too long for you, the Short Dangle tips use the same narrow metal crimps with a free-hanging teardrop charm that is only a few millimeters long. If the length you need is not one of the standard options in the drop down box, you can easily get a non-standard length by ordering the next longest size up and then adding an order note during checkout to let me know what length you really need (e.g. for 50" laces just select the 54" option and add a note saying you want 50" laces instead). All shoelaces are custom made-to-order items anyway, so a non-standard length request adds no additional time to your order. 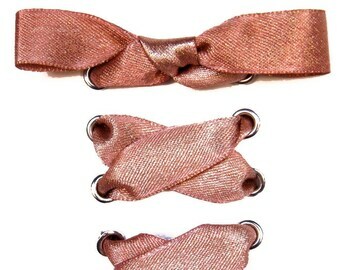 If you decide to go with a wider ribbon, say 7/8" or 1.5", it's usually a good idea to add a few inches to the length of the existing shoelaces since it takes more length to tie a bow with those wider shoelaces. BTW - If you opt to guess instead of measure, and you guess wrong, "zoom" in on the fourth photo to check out a couple ways to deal with shoelaces that are too short or too long. Orders are shipped two (2) US business days after order receipt (i.e. Monday through Friday on days that are not USPS holidays). For example, orders placed on a Thursday will ship the following Monday. Any temporary exceptions for weather alerts/emergencies will be posted in the shop's announcement on the home page at: http://lostinlaceboutique.etsy.com. *Larger orders (i.e. typically 30 or more pairs in a single order), may require additional time, and I will notify you of such time when the order is received, or you can of course ask me via convo prior to placing an order. Occasionally customers make requests in order notes or via convo that I cannot accommodate, and while I try to reach out right away for clarification, these requests can delay the order. 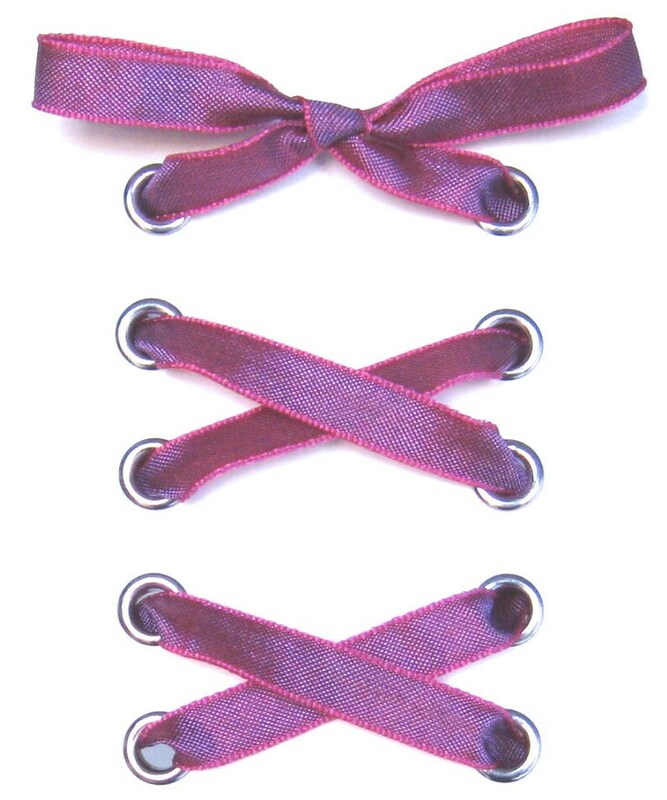 The most common delay is requests for tip options that are not available for the customer's selected shoelaces (only the tip options shown in the last photo are available for this listing). US orders are shipped via USPS First Class Mail for $3.79 no matter the quantity ordered! Shipping time averages 3-5 business days*. Once your order has shipped a tracking number will be emailed for your reference, although First Class Mail will often update tracking information only after the order is delivered, so please refer to your "order has shipped" email for the actual ship date. *Please read my shop policies at https://www.etsy.com/shop/LostInLaceBoutique/policy for more information about shipping and upgrades. International orders are shipped via USPS First Class Mail, and shipping time is typically 10-21 days, although some locations may take a few more weeks. Please note all duties, VAT and additional import fees are the responsibility of the buyer. International shipments cannot be marked as a gift or misrepresented in any way. 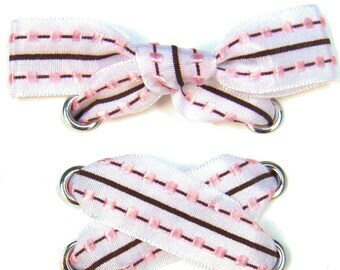 THE SHOELACES SHOP-Striped Ribbon Shoelaces, Shoe Laces, Cute Shoelaces, Pink Shoelaces, Custom Shoelaces, White Shoelaces, "Neapolitan"
THE SHOELACES SHOP-Jute Ribbon Shoelaces, Cute Shoelaces, Shoe Laces, Pink Shoelaces, Brown Shoelaces, Custom Shoelaces, "Just Jute Me"
THE SHOELACES SHOP-Hobnail Satin Ribbon Shoe Laces, Ribbon Shoelaces, Wedding Shoelaces, Custom Shoelaces, Cute Shoelaces, "Studded Satin"
THE SHOELACES SHOP-Pink Lace Shoe Laces, Ribbon Shoelace, Cute Shoelaces, Lace Shoelaces, Wedding Shoelaces, Custom Shoelaces, "In the Pink"
THE SHOELACES SHOP-Sneaker Ribbon Shoelaces, Shoestrings, Striped Shoe Laces, Cute Shoelaces, Custom Shoelaces, Pink, "Sneaker Recognition"
THE SHOELACES SHOP-Thin Velvet Ribbon Shoelaces, Shoe Laces, Cute Shoelaces, Custom Shoelaces, Shoestrings, Velvet Cord, "Thick & Thin"
THE SHOELACES SHOP-Purple Striped Ribbon Shoelaces, Shoe Laces, Satin Shoelaces, Cute Shoelaces, Custom Shoelaces, "Pretty in Purple"
THE SHOELACES SHOP-Metallic Ribbon Shoelaces, Shoe Laces, Metallic, Rose Gold Shoelaces, Cute Shoelaces, Custom Shoelaces, "Copper Rose"
Fast shipping! Love the laces. THE SHOELACES SHOP-Olive, Brown Iridescent Shoe Laces, Ribbon Shoelaces, Brown Shoelaces, Green Shoelaces, Shoestrings, "The Call of Olive"
Quick delivery, high quality item! Thanks. 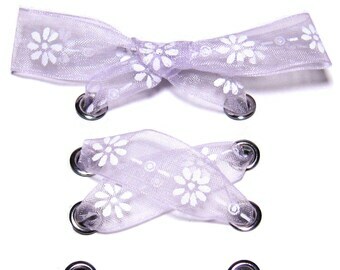 THE SHOELACES SHOP-7/8" Satin Ribbon Shoelaces, Wide Shoelaces, Wedding Shoelaces, Custom Shoelaces, Cute Shoe Laces, "Shine On (7/8 Inch)"
Lost in Lace is a Nebraska-based business, and I collect sales tax for all purchases shipped within the State of Nebraska. !! !VAT IS NOT INCLUDED!!! - See "International Shipping" in the Shipping section for details. If you have any questions, please convo me prior to placing an order, and if you've made an error in your order, please contact me immediately since I begin processing most orders as soon as they are received. I am unable to take cancellations once an order is made even if it has not yet shipped. Such orders would be subject to the returns terms stated below. Always convo me prior to returning an item to ensure it meets the terms of this policy and therefore qualifies for a return. I cannot pay to reship items that are returned outside of the terms of this policy. Items (valued at less than $75 total*) must be returned within 14 calendar days of the original delivery date, and upon receipt of the returned item(s), I will credit 75% of the listing price. If the original value of the returned item(s) is less than $30 and a new order of equal or greater value is submitted to replace the returned item(s), I will refund 100% of the of the listing price. Please note that I cannot refund shipping amounts since these are paid to the post office and others as fees - think of shipping costs like gas/parking costs for shopping at a brick and mortar store. Returned item(s) must be in new and unused condition and in the original packaging. The customer is responsible for returned product in transit (FOB Destination), so it's a good idea to go with something like First Class Mail since tracking and delivery confirmation are included. Refused/abandoned deliveries will be treated per the terms of this policy, so you will need to notify me of the expected return. The customer is still responsible for the return delivery of refused, misaddressed or abandoned orders since such orders are not always returned by USPS (and refused/abandoned deliveries rarely meet the 14 calendar day limit if they are returned, so it's always better to accept/pick up the order and send it back with new postage if you've changed your mind). As these are custom-made items, EU returns regulations do not apply, and I am not offering an EU returns option only due to the potential issues related to EU regulations if I do. For any EU customers with order issues, please just send me a convo to see if there is another appropriate resolution to your specific situation. Insurance may apply to some orders, so you'll want to retain all packaging and contact me immediately with any issues that would result in an insurance claim (e.g. damage, opened/missing items, etc.). The insurer may ask for information such as packaging photos, and this will need to be available so that they reimburse me for losses, and therefore I am able to reimburse you. ╘►╘►NO ADDITIONAL SHIPPING COST◄╛◄╛ for multiple items shipping to the US (it's a flat $3.79 for the US for the entire order). *Larger orders (i.e. typically 30 or more pairs in a single order), may require additional time, and I will notify you of such time when the order is received, or you can of course ask me via convo prior to placing an order. Orders are shipped via USPS First Class Mail, and shipping time is typically 3-5 business days*. Once your order has shipped you will receive a tracking number for your reference. Since tracking information is occasionally not updated until after delivery, please refer to your shipment confirmation email for the mailing date. Please note that all orders include delivery confirmation, and I cannot be responsible for lost delivered packages. Please be sure your address information is correct to avoid any such issues. You may track your package at http://www.usps.com or from your Etsy account. *For domestic orders that are not delivered within 21 business days, USPS will consider them lost, but prior to that time frame, they will consider orders to be in transit and not attempt further tracking. Shipping upgrades for US deliveries are available at checkout. Priority Mail is available for an additional $6.50 per shipment and typically takes 2-3 business days, although the Post Office does not guarantee this time frame. Priority Mail Express on the other hand is delivered within 2 business days (often overnight) and the delivery time is guaranteed through a rebate of $22 if the package arrives late (Priority Mail Express is available for an additional $22 per shipment). !! !VAT IS NOT INCLUDED!!! Etsy uses a default "VAT Included (where applicable)" note on all international prices, and shoelaces are an item where that note is indeed not applicable. You may want to check your country duties as in many cases the fees can include handling and other taxes in addition to VAT which adds up significantly (e.g. the UK). Please note all such duties, VAT and additional import fees are the responsibility of the buyer, and international shipments cannot be marked as a gift or misrepresented in any way. Orders returned as uncollected/refused due to VAT do not qualify for refunds as they fall way outside the terms of my published returns policy. Orders are shipped via USPS First Class Mail, and shipping time is typically 10-21 days, although some locations may take longer. Once an order has been transferred to the delivering country's postal service, I am unable to assist with tracking of lost orders. Please do let me know of lost orders in your country as I may need to prevent issues for future customers by not shipping to those locations. "TIP TEST" - Your listings state whether each tip option fits through Small, Medium or Large shoe eyelets, but how do I know if I have Small, Medium or Large shoe eyelets? This "Tip Test" will tell you which size eyelets you have. Try fitting a drinking straw through your eyelets (a narrower grocery store straw and not a wider fast food straw). If you can squeeze the straw through without deforming it, you have Large eyelets that work for all laces in this shop. If your eyelets don't pass the Straw Test, take a match from an ordinary book of matches (the paper ones in a book and not the wooden ones), and try fitting the head of the match through your eyelets. If the match head fits through, you have Medium eyelets that work for most laces in this shop. If your eyelets didn't pass the Match Test, you have Small Eyelets that work for the less bulky laces in this shop. How do I determine what length to order? At this time my wholesale business is no longer up and running, so I am not able to offer such discounts. I hope to get back into wholesale down the road though! Can you add lettering (e.g. wedding date) or logos to my shoelaces? No, I do not have any options for printing or embroidering on the shoelaces at this time. Can I get laces longer than 72 inches? 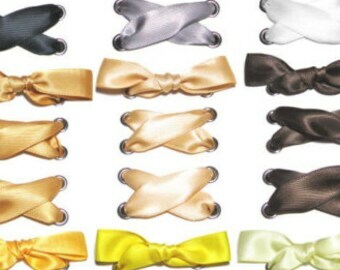 Yes, there are several listings that offer lengths up to 120 inches for basic ribbon styles (e.g. solid organzas, grosgrains and satins). 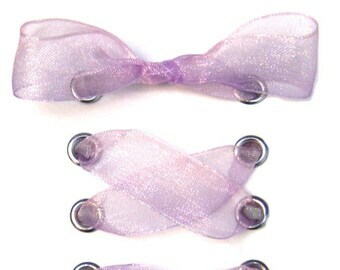 For limited edition ribbon styles that only offer lengths up to 72 inches, I can set up a private listing for longer laces. 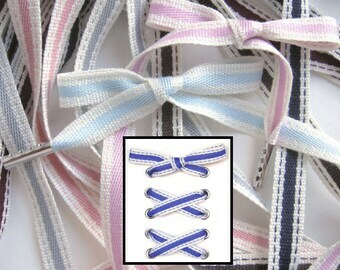 Prices for the longer laces are generally twice that of the shorter laces. The listing I want to order from says only 10 pairs of shoelaces are available, and I need 12. Can I get more? Yes, in most cases I have more stock than the listings indicate. Given the length variations in my listings, I tend to assume that each listing will sell at longer lengths than they actually do, and I therefore have more stock than shown. Just send me a convo with the length you need, so I can confirm my stock to be sure, and I will increase the quantity in the listing for you. 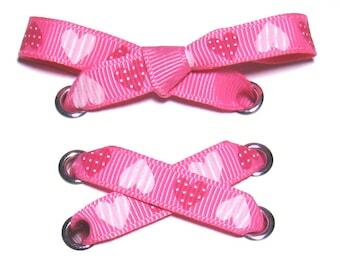 THE SHOELACES SHOP-Pink Grosgrain Hearts Ribbon Shoelaces, Shoe Laces, Cute Shoelaces, Heart Shoelaces, Shoestrings, Custom, "Heart2Heart"
THE SHOELACES SHOP-Polka Dot Ribbon Shoelaces, Ribbon Shoe Laces, Cute Shoelaces, Wedding Shoelaces, Custom Shoelaces, "Dot, Dot, Dot..."
THE SHOELACES SHOP-Lavender & Daisy Organza Ribbon Shoelaces, Shoe Laces, Cute Shoelaces, Purple Shoelaces, Custom Shoelaces, "Oopsy Daisy"
THE SHOELACES SHOP-3/8" Organza Ribbon Shoelaces, Cute Shoelaces, Wedding Shoelaces, Custom Shoelaces, Shoe Laces, "Sheer Joy (3/8 Inch)"
THE SHOELACES SHOP-Metallic Brown & Gold Ribbon Shoelaces, Shoe Laces, Metallic Shoelaces, Cute Shoelaces, Custom Shoelaces, "Molten Gold"
THE SHOELACES SHOP-5/8" Satin Ribbon Shoelaces, Custom Shoelaces, Wedding Shoelaces, Shoe Laces, Cute Shoelaces, "Shine On (5/8 Inch)"
THE SHOELACES SHOP-Ombre Pink & Purple Ribbon Shoelaces, Shoe Laces, Cute Shoelaces, Custom Laces, Organza Shoelaces, "Shades of Princess"